If you are a follower of Jesus, living in the United States, what do you make of this story from Matthew? What it does say to you about how we as a nation should respond to the plight of refugees, especially those who have fled from the carnage that is Syria? How much vetting is enough? According to Matthew then, Jesus starts his childhood as a refugee: fleeing from Judea to Egypt, then briefly from Egypt to Judea, and finally from Judea to Galilee. Jesus’s early childhood gives witness to the truth that Matthew will later have Jesus summarize in his own words: “Foxes have holes, and birds of the air have their nests; but the Son of Man has nowhere to lay his head” (Matt 8:20). The infant Jesus has nowhere to lay his head from the day he is born. 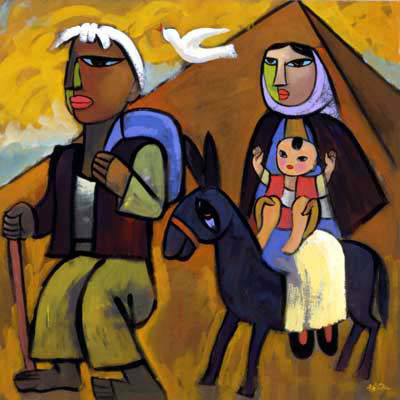 The Holy Family is a refugee family. [Feasting on the Word, p. 167]. The Holy Family was fortunate to get out of town in time. They found refuge. Unfortunately, not everyone living in Bethlehem was as fortunate. As is so often true in times of war and crisis, not everyone escapes. So, for the children living in Bethlehem who could escape, they faced the sword of Herod’s soldiers, and Rachel wept for her children. Yes, Jesus was spared for the moment. His time had not yet come. In the meantime, the innocents were slaughtered. We have watched, indeed, we have watched with disinterest, as the innocents have been slaughtered. We have watched as people have fled their homes, hoping to escape the slaughter. Too often they have found that the doors of welcome have been shut. What would have happened had the Egyptians turned Mary and Joseph and their child away, as our nation is turning away refugees? I don’t know if you will hear this passage read on Sunday, at least not in its entirety. It’s not a pleasant passage to start a new year, but perhaps it is a word we need to hear, and if we skip over the hard part, the slaughter of the innocents, will we miss something important? I’m not preaching Sunday, so I don’t have to deal with the passage. But in the end, we do have to deal with its message. What do you make of the story of the refugee status of the Holy Family? What message does it have for us as followers of Jesus? Picture Attribution: He, Qi. Escape to Egypt, from Art in the Christian Tradition, a project of the Vanderbilt Divinity Library, Nashville, TN. http://diglib.library.vanderbilt.edu/act-imagelink.pl?RC=46109 [retrieved December 28, 2016]. Original source: heqigallery.com.